Internet Marketing is one of the latest trends in making money online. It comes in various types like affiliate marketing, display marketing, etc. 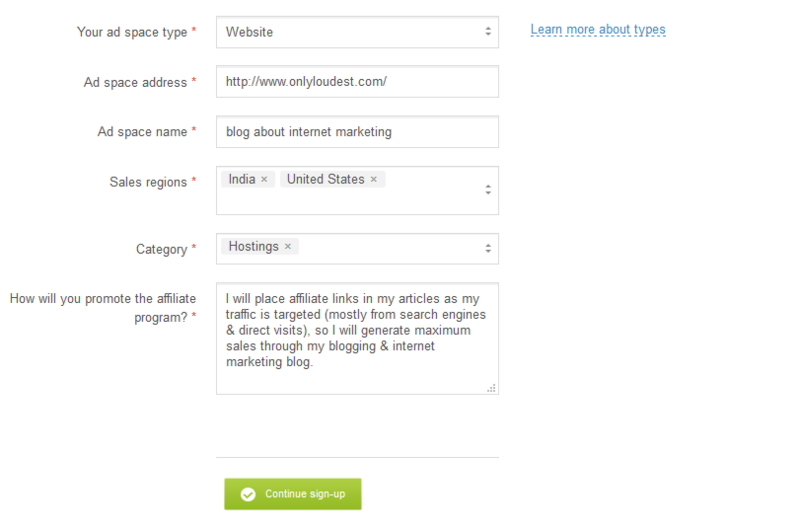 If you own a blog or any social media platform with a moderate following, you can take advantage of Affiliate marketing. All you need is an audience. Another trend in internet marketing is website advertising in the form of banner ads and text ads. Advertising requires a huge amount of traffic to mint money. This gives affiliate marketing an edge over advertising, as it does not require very large traffic. How to Sign up with admitad? Affiliate marketing works on the concept of word of mouth, but rather on a virtual platform. It is the process of recommending and thereby promoting a product to your audience. If your audience take to your recommendation and end up purchasing the product, the company pays you a commission. This works most of the time because your audience follow you as they trust your expert advice. But make sure you only market quality products and promote its positive features in an actionable way. Speaking of actions, you need to know about CPA marketing. CPA stands for ‘cost per action’. As the name gives away, in CPA marketing you get paid for an action your audience perform by following the affiliate link. These actions could vary from signing up, taking a free trial, filling a survey form, liking or sharing on social media etc. 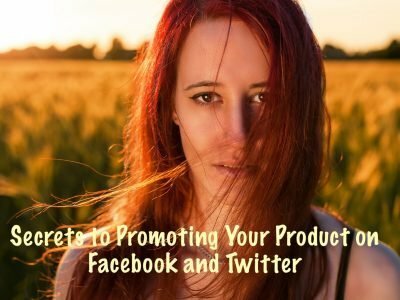 Convincing your audience to take these actions is easier than convincing them to buy a product. A lot of bloggers and social media marketers make money as high as 6 digit figures from CPA marketing. For a single conversion. you could get paid anything from $0.10 to $50. This is where CPA networks like ‘admitad’ come into play. Headquartered in Germany, admitad is a global network of Cost-Per-Action affiliate programs. Founded in 2010, admitad has made its mark in the affiliate marketing industry in its 7 years of operations. Today, this CPA network works with 1300 esteemed international brands and over 540 000 active publishers. Since its inception, the company has witnessed six consecutive years of revenue growth exceeding 100%. The reason behind this successful growth model is the company’s commitment to providing advertisers with reliable sources of sale and publishers with the opportunity to monetize their traffic. admitad collaborates with giants like Alibaba, Booking.com, Citibank, eBay, Target Microsoft, Nike and Adidas. Some popular brands and websites work with admitad for their marketing campaign and enjoy a host of benefits. Access the following benefits by joining admitad to pursue your CPA affiliate marketing. 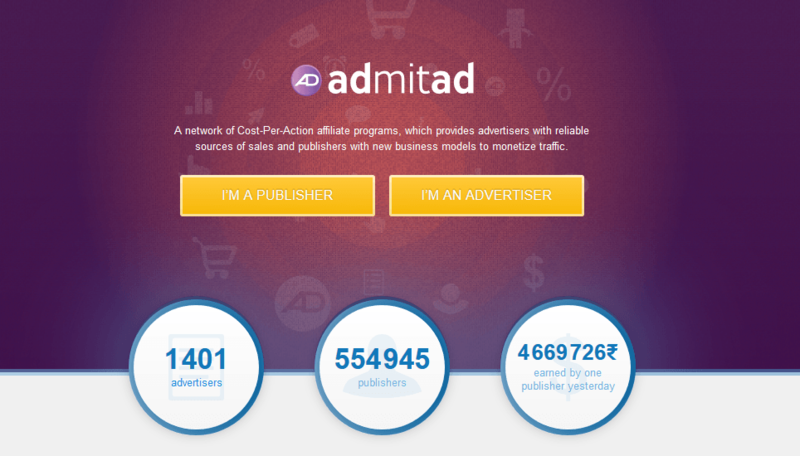 admitad brings both the advertisers and publishers under a single platform and presents them the global market under its in-house platform. admitad also offers various tools, analytics and security against fraud to help both parties optimise their marketing strategies and revenues. The website is designed in an user-friendly manner where the icons are arranged in a neat, easy to use way on the navigation bar. After completing a simple and straightforward signing up process users can access the website and select their options from the navigation bar. Clients can easily choose the options that they require on this user-friendly interface. Irrespective of your product or service sector you can find matching advertisements for your site as admitad partners with an array of product and service providers. Some of the categories that feature regular campaigns in admitad are apparel and accessories, consumer goods, car goods, mobile phones, online games, finance, food delivery, travel, etc. Unlike most affiliate networks that follow monthly payment schedule, admitad follows a weekly payment pattern. The payment modes are flexible with a variety of options like Paypal, e-payments and Wire Transfer in all major currencies. The payment threshold is $10 or its equivalent in other currencies. Publishers working with admitad are offered a faster payment turnaround on validated transactions. For approved campaigns publishers need not wait till the advertisers pay admitad for the billing. Another noteworthy feature is the access given to publishers for funds withdrawal even when the advertiser’s balance is negative. admitad assigns an individual account manager for each client with no extra costs involved. Clients get a completely personalised service with native language support, personal mentor and professional support. These services are offered to help clients optimise their marketing and gain considerable knowledge on converting traffic, building high ranking websites, etc. A professional support team is at your disposal to solve any issues. To enhance the performance of affiliate marketing, statistics and analytics are very important. That is why admitad offers an in-depth, transparent report of impressions, clicks and actions. The report can be exported to external software in XML and XLS. It can also be exported to Excel, which is a great advantage. Clients can feed data to their system via Admitad API and Postback URL. Clients are offered a plethora of tools that can be used to analyse and enhance their performance. Tools like charts, graphics, metrics and dashboards are available for publishers. Publishers can get fair reports using these tools to strategize and optimise their affiliate marketing. Advertisers can access tools such as fingerprint tracking, cross device tracking, anti-fraud, anti-cookie, deep linking options etc, to improve conversion and security of the campaign. 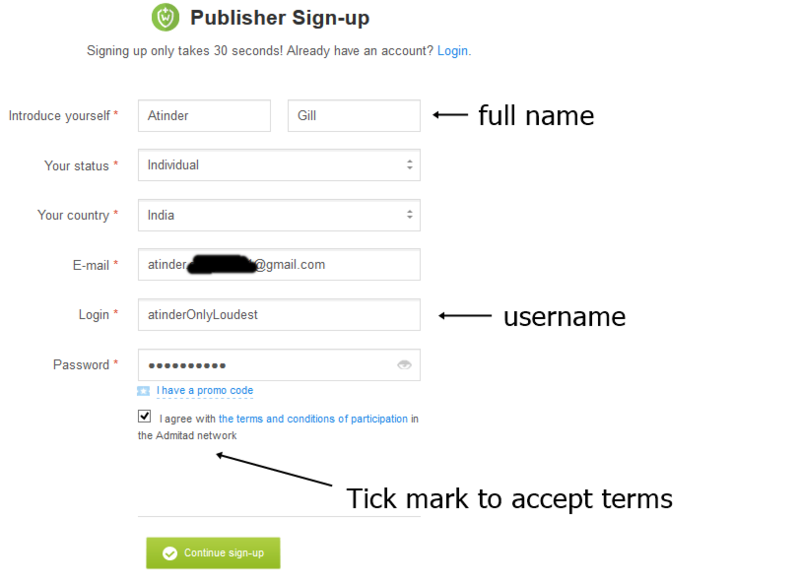 It is super easy for publishers to sign up, you can do it like in few minutes only and in case you need any help, you can follow the steps given below. Step 1:- Go to www.admitad.com or click “Sign Up” button given below. Step 2:- You will land on registration page, if you click on the Sign up button, right there you need to fill all the details correctly like shown in the screenshot given below & then click “Continue Sign-Up”. Step 3:- Now, add your website / YouTube Channel URL / Social Media Profile URL details correctly like shown in screenshot & then click “Continue Sign-Up”. Step 4:- Now, you will receive a verification email to verify your account, check your inbox and click on the verification link. 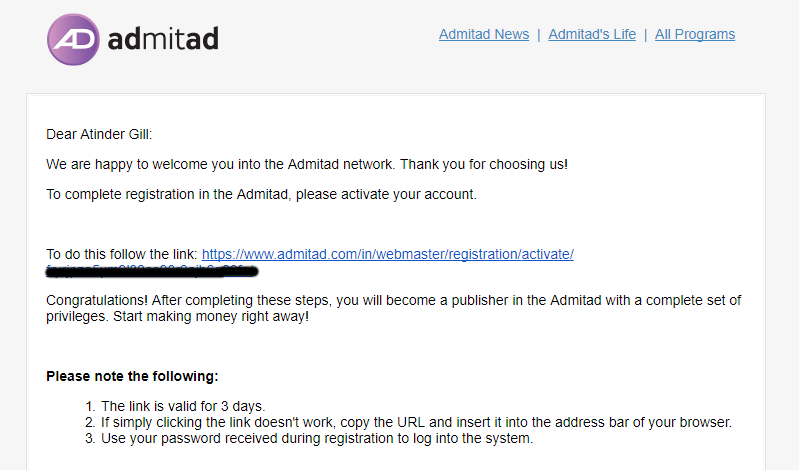 Step 5:- You have successfully created an account with admitad. Now, finally you need to verify the ad space to enable all the system’s features. 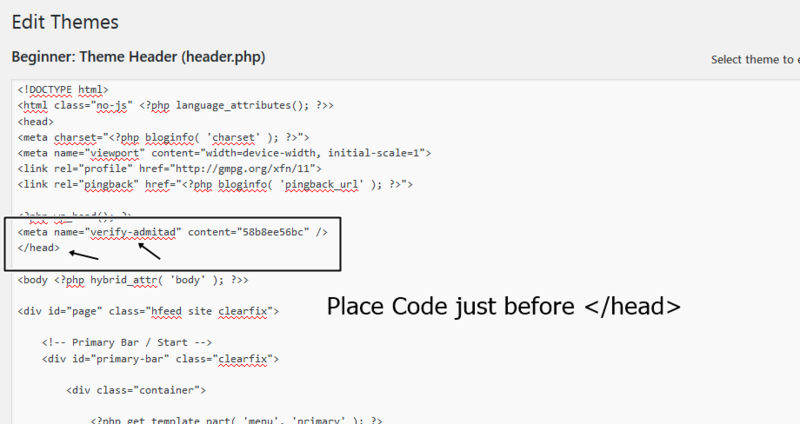 Step 6:- After placing the code in head section, click on “Done, check it” & within seconds your ad space will be verified. That’s it. Now, you will have full dashboard filled with tons of features, which you can test to kick start your new & rocking journey with admitad. admitad offers great deals with attractive conversion rates that can help monetize your traffic. Join the large community of people making up to millions using affiliate marketing. The tools offered by admitad provide valuable insights on the current performance of your marketing campaign and the course to enhance it. This CPA network covers a wide range of topics. So publishers and advertisers specialising in any category of product or service can find suitable programs and campaigns. Plus admitad provides each client with a personal mentor with inside knowledge about each niche. Access support in your native language to optimize your campaign including publisher expansion and manual vetting. Geographically, admitad has the strongest presence by volume in US, Russia, Western Europe, UK and India. Renowned international brands and website owners from these areas opt admitad for their marketing. Join the bandwagon of such renowned names and take your website to the next level with admitad. One of the highest conversion rates in the business, you can make a lot of money with this CPA network. So, go on and sign up today to rock & roll with admitad. There are many CPA ad networks available in internet but Admitad covers a wide range of topics. Nice post, thanks for sharing. Thank you for sharing great article for me. you should daily update article. nice post dear, thanks for sharing useful information……..
Amazing Post! Thanks for sharing. Well I have been trying very hard to learn all about CPA and seems like “admitad CPA network” fulfill my wish. I will surely try out. Thanks for sharing this informative and great post. 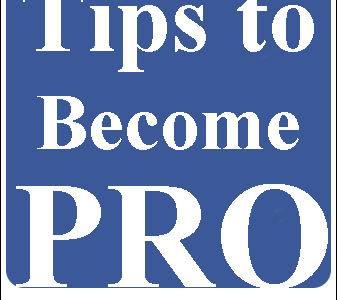 It helped me a lot to take affiliate marketing to the next level and all the steps are very valuable. Please keep writing the articles with new unique ideas. previous post: What is a Web Host and Do I Need One?